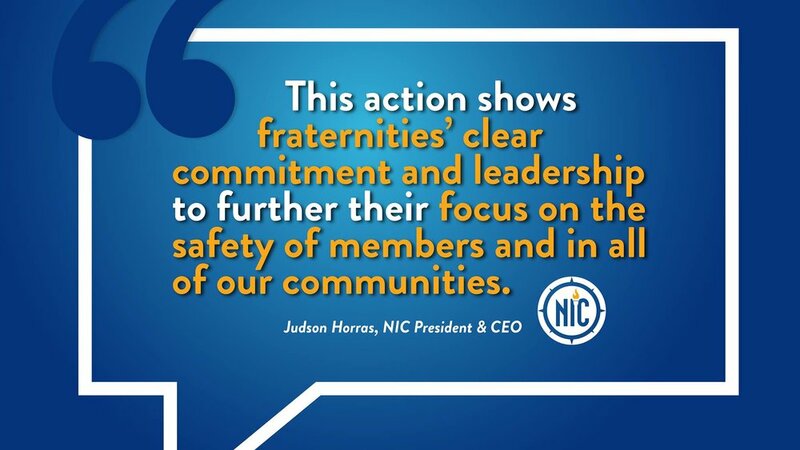 INDIANAPOLIS—In an important, decisive action to enhance health and safety in fraternity communities, the North American Interfraternity Conference (NIC) recently adopted a Standard prohibiting hard alcohol from fraternity chapter facilities and events. At its Aug. 27 Annual Meeting in a near unanimous vote of its 66 inter/national fraternities, the Conference determined that each organization will implement the new Standard by Sept. 1, 2019, across their more than 6,100 chapters on 800 campuses. "At their core, fraternities are about brotherhood, personal development and providing a community of support. Alcohol abuse and its serious consequences endanger this very purpose," said Judson Horras, NIC President & CEO. "This action shows fraternities' clear commitment and leadership to further their focus on the safety of members and all in our communities. "This is the latest in a series of NIC Health & Safety Initiatives launched in the last year, including Conference-wide adoption of medical Good Samaritan policies; piloting further measures to reduce alcohol; developing SocialSafe, an online event management platform and app; testing measures to reduce hazing in the new member experience; and advocating for stronger anti-hazing laws. "Our IFC and member fraternities eliminated hard alcohol from facilities and events on our campus several years ago and have seen a positive shift in our culture when it comes to the health and safety of our members and guests," said Seth Gutwein, Purdue University IFC President. "With all NIC fraternities implementing this critical change, it will provide strong support for fraternities to move as one to make campus communities safer." Under the resolution passed by the Conference, each NIC member fraternity will "adopt and implement a policy by September 1, 2019, that prohibits the presence of alcohol products above 15% ABV in any chapter facility or at any chapter event, except when served by a licensed third-party vendor. Chapter facilities and events outside the United States may have one additional year to achieve compliance. Any member fraternity that does not have a business meeting between Sept. 1, 2018, and Sept. 1, 2019, will be granted a one-year extension in adoption." As with all NIC Standards, this is a minimum expectation; when member fraternities and campuses have more restrictive policies, students and chapters will still be expected to follow those. Click here to view this release online and here for more information, including Frequently Asked Questions. Download a PDF of the release here. The North American Interfraternity Conference is a trade association that represents 66 inter/national men's fraternities, with more than 6,100 chapters located on more than 800 campuses in the United States and Canada, with approximately 385,000 undergraduate members and nearly 4.2 million alumni.